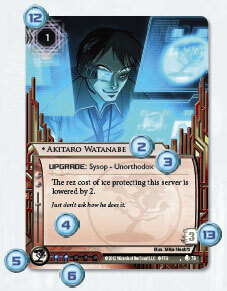 There are six types of Corporation cards: identities, operations, agendas, ice, upgrades, and assets. 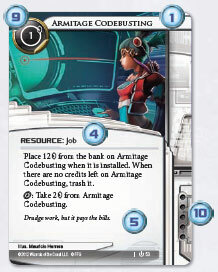 All cards except the identity card are shuffled into the Corporation's deck at the beginning of the game. 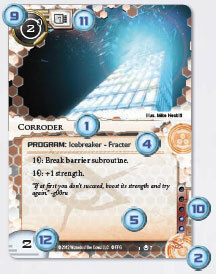 Corporation cards are installed facedown, and are inactive unless rezzed. Identity cards indicate which identity the Corporation has assumed. 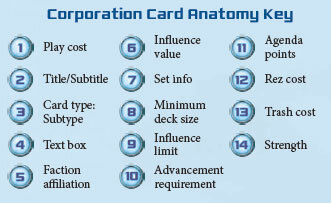 The Corporation identity card defines the Corporation's faction and describes the identity's special ability. It also provides a minimum deck size that must be observed when deckbuilding 8 and the amount of influence available for spending on outof-faction cards 9. Note: The Corporation's identity card also represents his HQ for the purposes of card installation: ice protecting HQ is installed in front of the Corporation's identity card, and upgrades installed in the root of HQ are installed behind the Corporation's identity card. Operations represent singular occurrences and are always trashed after being played. 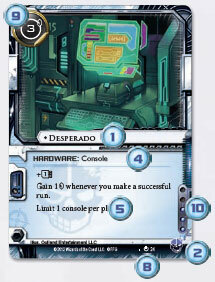 The Corporation pays credits equal to the play cost 1 of an operation to play it. When played, an operation's abilities as listed in its text box 4 are resolved. Then, the operation is immediately trashed. Operations are never installed. 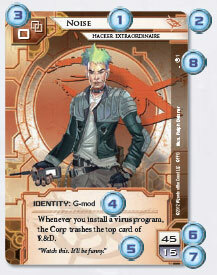 Agendas are valuable pieces of the Corporation's data, and are the only cards in that are worth agenda points. The Corporation installs agendas in remote servers. 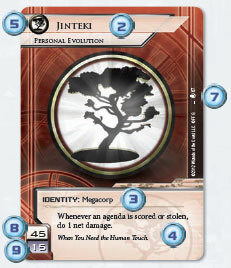 Agendas are the only cards in the game worth agenda points (11). Agendas have an advancement requirement (10) that must be met before the Corporation can score them. Agendas cannot be rezzed and are only active while in a score area. There can be only one agenda or one asset installed in a remote server at a time. Ice defends the Corporation's servers against intrusions by the Runner. The Corporation installs ice in front of any server. 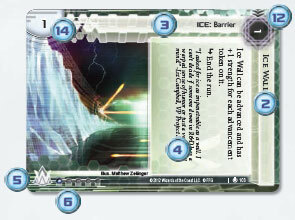 Ice is not active until it is rezzed by paying credits equal to its rez cost (12). A piece of ice has one or more subroutines | in its text box 4 that the Runner must break during a run or suffer their effects (see "Ice" on page 16) if the ice is rezzed. Upgrades are improvements to a server that provide the Corporation with a wide variety of benefits and bonuses. The Corporation installs upgrades in remote servers or the roots of central servers. Upgrades are the only card type that can be installed in the root of a central server. An upgrade is not active until it is rezzed by paying credits equal to its rez cost(12). There is no limit to the number of upgrades that can be installed in a server. When the Runner accesses an upgrade, he can trash it by paying credits equal to its trash cost (13). Assets provide the Corporation with resources and connections that help him advance and score his agendas. The Corporation installs assets in remote servers. An asset is not active until it is rezzed by paying credits equal to its rez cost (12). 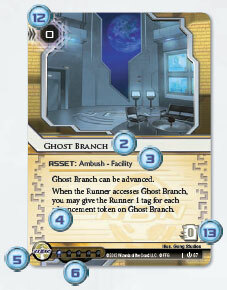 Some assets can also be advanced, giving them the appearance of agendas and potentially misleading the Runner. When the Runner accesses an asset, he can trash it by paying credits equal to its trash cost (13). There can be only one agenda or one asset installed in a remote server at a time. 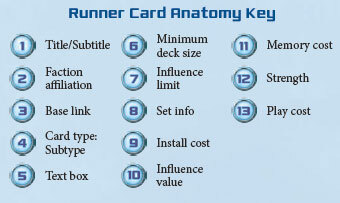 There are five types of Runner cards: identities, hardware, resources, programs, and events. All cards except the identity card are shuffled into the Runner's deck at the beginning of the game. 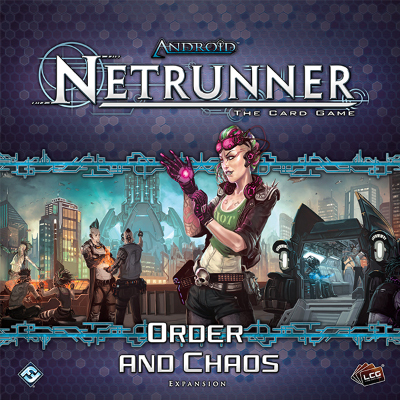 Runner cards are always active while installed. Identity cards indicate which identity the Runner has assumed. 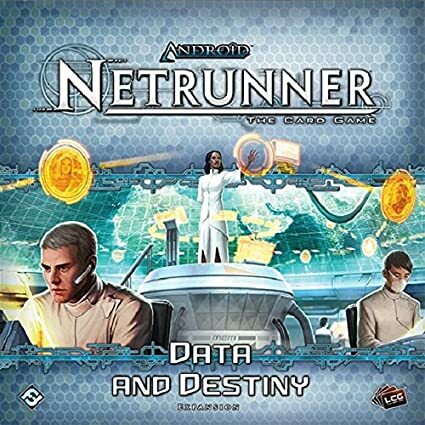 The Runner identity card defines the Runner's faction and describes the identity's special ability. 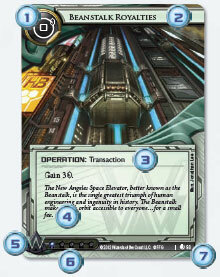 It also provides a minimum deck size that must be observed when constructing a deck 6, and the amount of influence available for spending on out-of-faction cards 7. 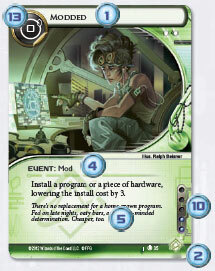 See "Deckbuilding" on page 24 for more information. Hardware is the array of physical tools at the Runner's disposal. The Runner installs hardware in his rig by paying an install cost 9. There is no limit to the amount of hardware the Runner can install in his rig. Resources are a wide variety of connections, assets, and skills that aid the Runner. The Runner installs resources in his rig by paying an install cost 9. There is no limit to the number of resources the Runner can install in his rig. 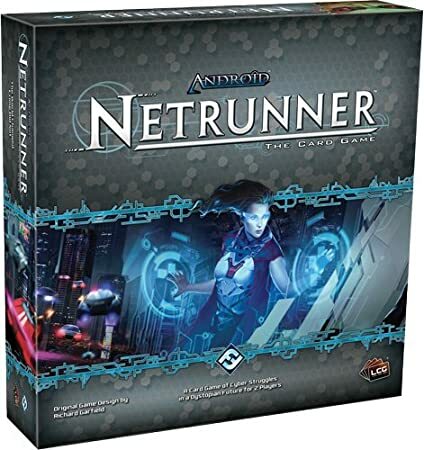 When the Runner is tagged, resources may be trashed by the Corporation. Programs are digital tools at the Runner's disposal, primarily used as a means of intrusion. The Runner installs programs in his rig by paying an install cost 9. Programs are the only card type that have a memory cost (11). The memory cost of his installed programs can never exceed his current memory limit. The Runner uses a program subtype called an icebreaker 4 to break ice subroutines during runs. An icebreaker's strength (12) must be equal to or greater than the ice it is interacting with. Events represent singular occurrences and are always trashed after being played. The Runner pays credits equal to the play cost (13) of an event to play it. When played, an event's abilities as listed in its text box are resolved. Then, the event is immediately trashed. Events are never installed.